Atlanta Falcons quarterback Matt Ryan is sacked by New England Patriots' Trey Flowers during the first half of the NFL Super Bowl 51 football game Sunday, Feb. 5, 2017, in Houston. Limited to only one game his rookie year, Trey Flowers became a force in New England's defensive line this past season. Flowers' development was a key element in the Pats' Super Bowl championship run. FOXBORO - He spent the season carving out a niche out for himself as an integral piece of the Patriots' future. Last Sunday night, he played a major role in history. 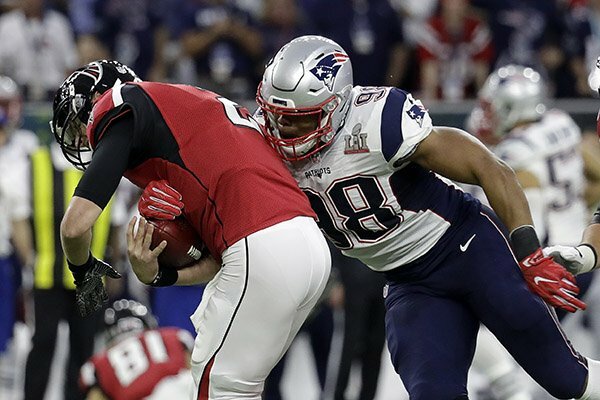 A non-participant (he appeared in one game) his rookie season, Trey Flowers capped off his second year with the team by registering 2 1/2 sacks in the Patriots' 34-28 overtime victory over Atlanta in Super Bowl LI at NRG Stadium. If Flowers made a statement during the season - and he did - this was the exclamation point. "Trey Flowers is one of the better players in the league," linemate Alan Branch, a 10-year NFL veteran, said in the aftermath of the big game. "He's definitely going to have a lot of people paying attention to him next year because that guy's a monster. "I think he's one of the better pass rushers and one of the better all-around defensive linemen in the league. I give him all of the credit in the world. To me, he's one of the best." Flowers' biggest contribution last Sunday night was a 12-yard sack of Matt Ryan that helped prevent the Falcons from kicking what could have been a fourth-quarter field goal that would have denied the greatest comeback in Super Bowl history. "It still hasn't hit me yet," Flowers said upon the team's arrival home from Houston earlier this week. "I've been seeing (the sack). A lot of people posted about it and it was all on TV and things, but it's just one of those that I really have to sit down and say, you know, 'Twenty years from now, people are still going to talk about this game. You came back 25 points, the first overtime victory win (in the Super Bowl), it was big.' It still hasn't hit me, but it feels good." Flowers had his share of hits this season: 14 quarterbacks hits and seven sacks to be exact, both team highs, while his 45 tackles ranked eighth on the Patriots. All of that contributed to a defense that was the NFL's stingiest during the regular season, surrendering just 15.6 points per game. Facing a 28-3 third-quarter deficit (and, in defense of the defense, recall that seven of the points came on a pick-six) on Sunday night, the unit shut down the league's highest-scoring offense (33.8 points per game during the regular season, 40 PPG in its first two postseason games), allowing the Patriots' offense to rally. The Falcons' final four possessions consisted of 16 plays and resulted in three punts and a turnover. "(It was) guys (that) just continue to fight, guys that do their job and do their job well," said Flowers. "I just think that all the people who doubted us and all the people who said we didn't play any good teams, good opponents, things like that, they really weren't watching film, really weren't understanding the scheme of things because this defense, we just do what it takes to win. "So whatever it takes, whether it's dropping back eight or rushing three or whatever, a lot of guys buy into it and we're going to play our role and do it well." A fourth-round pick out of Arkansas in the 2015 NFL Draft, Flowers lacked a role his rookie season, injuries limiting him to four plays in one game in a year he finished on the injured reserve list. "A year ago, outside looking in, just trying to get on the field, just trying to participate and just be able to not only participate but participate well and produce for my team to help them win, that's what I worked hard for and that's what I prepared for," said Flowers. "So it was good to get the results." The results - the rapid development of the 6-foot-2, 265-pounder - may ultimately make unrestricted free agent Jabaal Sheard, who had eight sacks in 2015, expendable. Flowers was indispensable last Sunday night, answering the call when the Patriots were in dire need of (yet another) game-saving play, his sack of Ryan moving the Falcons back from New England's 23 to its 35. "I knew they've got a good field-goal kicker (Matt Bryant) so I knew another play had to happen or we had to count on him missing it, but then we got the holding call on Chris Long (the defensive end was held by Falcons offensive tackle Jake Matthews) so that pushed them even further. That just made them negate the field and go for the punt, so that was a big stop right there by the defense."